Disclosure Agreement: Review of MeasureGlass was due to compensation from the company’s whose products were reviewed. We Dish Nutrition tested each product thoroughly and gives high marks to only the very best. Opinions expressed at We Dish Nutrition are our own. Adequate nutrition and optimal exercise is only successful when in conjunction with adequate hydration. While using bottled Poland Spring or generic store brand water bottles can be used as a gauge of how much water you’re drinking per day, as we know, it’s 16.9 ounces, what if you don’t want an entire water bottle? What if you want to partake in more sustainable practices and not add to the elusive amount of waste we have already created and accumulated? Glass cups and measuring cups are great addition to any household or individual that wants to quickly track liquid intake. Especially the MeasureGlass created by Mr. Rob Jones. The concept behind MeasureGlass is great! As we all know, the size and width of glasses are all different, but by observing a concrete number of how many ounces you’re drinking per day limits future headaches! I know my competitive side comes out when I can visually see how many ounces I’ve had within a given time period instead of drinking from an ungraved glass. MeasureGlass is sturdy and microwavable safe. 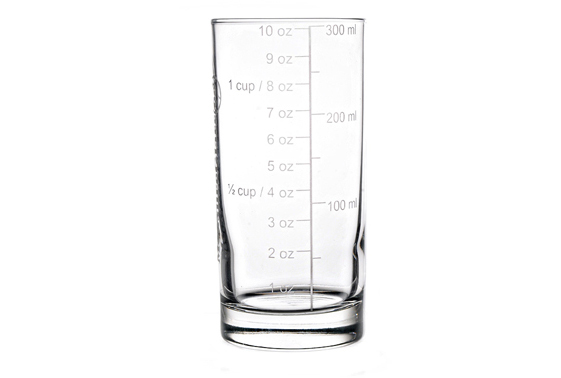 Additionally, there’s no need to rummage through your cabinets to find appropriate measuring cups as the glass’ measurements don’t wear off with use. It’s worth noting that without a pouring spout, pouring liquids can get messy, so keep a towel nearby. Future recommendations I have for MeasureGlass include the offering more than just the 10.25 ounce glass. I personally would prefer a glass that is a solid 2 cups/16 ounces, which is easier to track how much I have drank throughout the day. Adding up 10.25 ounces times 4 times throughout the day isn’t as quick of mental math for me as 16 ounces times 2. The offer of larger sizes of MeasureGlass could be a great way to expand the product as well. I would be more likely to use a 32 ounce glass as I tend to be on the go. With that said, a glass lid would be a positive addition as I don’t want the glass spilling water all over my car. I have also noticed that it can be hard to see the engraved measurements, so future MeasureGlasses might use red, black or blue writing measurements for the glass’ measurements to stand out more against milk or other nonwhite liquids. MeasureGlass helps one track liquid intake by measuring out the amount of liquid one wants to drink at that moment, with manually tallying of consumption required. MeasureGlass has a lot of potential and I appreciate the founder, Rob Jones’ initiative and contribution to the nutrition and health industry. You can purchase the MeasureGlass directly from the website and/or from Amazon for $14.95! Have you tried MeasureGlass yourself? What tips do you have for consumers to best utilize their MeasureGlass? Next How Sporty Is Your Sport? I like your review style, We Dish. Would love to have you also share your reviews on reviewcreep.com and get you some free exposure. The easiest way to get started is by using your existing review blog posts since you’ve already done the work… just enter your wordpress blog url when it asks for it during the quick signup… it will make it easy to add all your existing reviews. Our marketing team is going to be sending out the top reviews in a daily/weekly curated email to our entire list. Thanks. Had a hard time signing up. When I tried signing up with FB login, going in circles, not able to successfully sign up. Also, wasn’t able to successfully login manually as it wouldn’t take the ‘verification’ of last 5 digits of last missed call. Suggestions? It seems I was able to login. I don’t have receipts of the products I’ve reviewed as I was given the products in exchange for the publicity of the review. Any way I can proceed with publishing post without including a receipt?